How high up do meteors occur? How big are most meteoroids? How fast do they travel? How many meteors can I expect to see if I go out to observe them when no meteor shower is occurring? What is a meteor shower? Does a shower occur “all at once” or over a period of time? How can I find out when a meteor shower is occurring, where and how to look, and what to expect? Does the published meteor rate for a shower really represent what I should expect to see? I thought I saw a lot of meteors coming from a certain part of the sky last night, but I can’t find any shower listed in my books. What was going on? What is a meteor storm, and how often do they occur? Where can I get more information about the Leonid storms? Is there a chance of a meteor from a meteor shower or storm reaching the ground as a meteorite, and is it dangerous to observe meteor storms? Where can I find information on historical meteor observations? Below are some relatively concise answers to the above questions. If you need further clarification or have further questions, please feel free to contact us via electronic mail. 1. What is the difference between a meteor, a meteorite, and a meteoroid? Download a printable version of this poster for FREE. Meteoroids are the smallest members of the solar system, ranging in size from large fragments of asteroids or comets, to extremely small micrometeoroids. Whenever a meteoroid plows into the Earth’s atmosphere, it will create a brief flash of moving light in the sky, called a meteor. Meteors were once thought to be a purely atmospheric phenomena, and the study of these and other atmospheric effects, especially weather, spawned the science of meteorology. It was not until the mid-1800’s that the extra-terrestrial nature of meteors was widely recognized. If remnants of the parent meteoroid survive the trip through the atmosphere to reach the ground, then these remnants are called meteorites. 2. How high up do meteors occur? Most meteors occur in the region of the atmosphere called the thermosphere. This “meteoric region” lies between about 80 km and 120 km (50 to 75 miles) in altitude. This is a general guideline only, since very fast meteors may first become visible above this height, and slow, bright meteors may penetrate below this band. 3. How big are most meteoroids? How fast do they travel? The majority of visible meteors are caused by particles ranging in size from about that of a small pebble down to a grain of sand, and generally weigh less than 1-2 grams. Those of asteroid origin can be composed of dense stony or metallic material (the minority) while those of cometary origin (the majority) have low densities and are composed of a “fluffy” conglomerate of material, frequently called a “dustball.” The brilliant flash of light from a meteor is not caused so much by the meteoroid’s mass, but by its high level of kinetic energy as it collides with the atmosphere. Meteors enter the atmosphere at speeds ranging from 11 km/sec (25,000 mph), to 72 km/sec (160,000 mph!). When the meteoroid collides with air molecules, its high level of kinetic energy rapidly ionizes and excites a long, thin column of atmospheric atoms along the meteoroid’s path, creating a flash of light visible from the ground below. This column, or meteor trail, is usually less than 1 meter in diameter, but will be tens of kilometers long. The wide range in meteoroid speeds is caused partly by the fact that the Earth itself is traveling at about 30 km/sec (67,000 mph) as it revolves around the sun. On the evening side, or trailing edge of the Earth, meteoroids must catch up to the earth’s atmosphere to cause a meteor, and tend to be slow. On the morning side, or leading edge of the earth, meteoroids can collide head-on with the atmosphere and tend to be fast. 4. How many meteors can I expect to see if I go out to observe for them when no meteor shower is occurring? The number of random, or “sporadic” meteors that can be seen in the night sky is quite variable, depending upon such factors as the time of night, time of year, light pollution, and cloud conditions. Perhaps the most important factors necessary in order to observe meteors are to have a clear, unobstructed view, out in the open, and under as dark sky conditions as possible. Over the course of a night, it will be noticed that more sporadic meteors can be seen in the hours before sunrise than in the hours after sunset. This is due to the motion of the Earth as it revolves around the sun, with the leading edge (morning side) of the Earth encountering more meteoroids than the trailing edge (evening side). In general, 2 to 3 times as many meteors can be seen in the hour or so just before morning twilight, than can be seen in the early evening. Additionally, the numbers of random, or sporadic meteors will also vary from season to season, due to the tilt of the Earth on its axis and other factors. As a general rule, about 2 to 3 times as many sporadic meteors can be seen in the early fall (September) as can be seen in the early spring (March). Together, these two effects can generate a fluctuation in the hourly rate of sporadic meteors by a factor of 4 to 9 times, over the course of the year. Under good conditions, only about 2-4 sporadic meteors can be seen per hour in the early evening in March, with this rate increasing to about 4-8 sporadic meteors per hour by morning twilight. These rates will then slowly increase throughout the spring and summer. By the month of September, the evening sporadic rate will be up to about 4-8 meteors per hour, increasing up to about 8-16 sporadic meteors per hour by morning twilight. Throughout the remainder of the fall and winter, these rates will slowly drop off, returning to the March levels again. Note that these rates are rough guidelines only, with random statistical fluctuations, observing conditions, and personal perception all playing a role in the actual number of meteors seen. 5. What is a meteor shower? Does a shower occur “all at once” or over a period of time? Meteor shower rates are highly variable, with the number of shower meteors seen following a curve of activity which usually lasts several days. Beginning at some level below the sporadic meteor background rate, the number of shower meteors seen will increase exponentially as the Earth approaches the densest portion of the stream. The rate will then peak at some maximum level, followed by a decreasing exponential decay back below the normal sporadic level as the Earth leaves the stream. The duration of peak activity can vary widely between showers. Some meteor showers (such as the Quadrantids) have very sharp maximums, displaying their best rates for only a few hours each year. Other major showers (such as the Taurids) have a broader maximum, which can span across a few nights. Meteor streams also vary greatly in strength between each other, depending upon such factors as the stream age, parent body composition, stream particle density and distribution, and how close the earth approaches to the stream core. Of the 10 major meteor showers, the low-rate showers (such as the Taurids and April Lyrids) will produce only about 10-15 meteors per hour at their peak under good conditions, while the high-rate showers (such as the Perseids or Geminids) can produce up to 50-100 meteors per hour at their peaks. It is important to note that even the high rate showers will still produce only about 1 to 2 meteors each minute, with faster or slower periods occurring over time. Along with the major meteor showers, there are also a number of minor meteor showers which, while greater in number than the major streams, are difficult to detect above the background sporadic meteor rate. These showers will generally yield only about 1-5 meteors per hour at their maximums, with only a sprinkling of meteors produced on non-maximum nights. It usually requires many hours of observing experience in order to correctly recognize and classify minor shower meteors. 6. How can I find out when a meteor shower is occurring, where and how to look, and what to expect? In order to successfully observe a meteor shower, some familiarity with the night sky is usually required, including the use of star charts to locate constellations and locations on the celestial sphere using the Right Ascension / Declination coordinate system. Plan your observing session as close to the time of shower maximum as possible. Meteor showers are usually quite disappointing under city and suburban conditions, so a dark observation site, far from city lights is preferred. Similarly, Meteor showers which occur near the time of gibbous or full moon usually do not perform well. Many meteor shower radiants do not rise before midnight, making most meteor showers best between midnight and morning twilight. Once at the observation site, ample time should be allotted for your eyes to adjust to dark conditions, as this can take over an hour for full dark adaptation. No magnification devices will be necessary. The use of all lights should be minimized, with only dim, red pen-lights or flash-lights used sparingly. Most meteor observers observe from a reclining position, either in a lawn chair or sleeping bag, with their gaze directed about 45 degrees above the horizon, in the general direction of the shower radiant. The best portion of the sky to watch is usually an area of sky about 30 degrees away from the radiant point for the shower. Due to the effect of perspective, shower meteors which appear very close to the radiant will be quite short in length, while those which appear some distance from the radiant can be quite long. Members of the same shower, while varying greatly in brightness, will share common characteristics, such as speed, color range, and potential for leaving behind a train (a glowing wake of air left behind after the meteor has passed). It will also be noticed that the number of shower meteors seen will improve as the radiant gets higher in the sky. This is because meteors seen near the horizon are much farther away than those seen directly overhead, making them dimmer and harder to notice. Also, the light from a meteor near the horizon must pass through much more atmosphere to reach the observer than for a meteor overhead, further attenuating the light from meteors at low elevation angles. Perhaps the key work to remember in meteor observing is patience. Most meteor showers will not produce a spectacular display, but will instead produce a steady, reliable show — sometimes with a few surprises. Meteor watching is like watching a graceful, natural fireworks display, and you never know when or how bright the next “shot” will be. 7. Does the published meteor rate for a shower really represent what I should expect to see? Many publications which list meteor shower rates will often give a corrected value, called the Zenith hourly Rate (ZHR) which standardizes the shower rate to optimum observing conditions. The shower rates listed are usually corrected for fully dark skies, and the meteor radiant point has been artificially located at the zenith, directly overhead. The actual rate of meteors seen by most observers, however, will be lower than this corrected value. Below is a table showing actual expected values for the major meteor showers, along with their corrected ZHR’s. Other publications may show somewhat different rates. These rates have been oriented to central U.S. latitudes. The quoted values are “smoothed” and do not represent those rarer times when abnormally high or low rates occur. We have selected the better years, assuming that a sharp observable peak occurs in your longitude. calculated Zenith hourly Rate, ZHR. The Quadrantids more often than not will give a display in the low 20’s; you have to be fortunately placed to do better. The large difference in the rates for the Eta Aquarids is attributed to the southerly declination of the radiant. Observers in the northern tropics southward see much better rates for this shower. 8. I thought I saw a lot of meteors coming from a certain part of the sky last night, but I can’t find any shower listed in my books. What was going on? There are several possibilities here. First, it is possible that you caught the peak of a minor shower, not listed in most texts. Consulting a more extensive shower list may reveal a match. Second, random sporadic meteor activity will occasionally increase above the average level, giving rise to the suspicion that a shower may be in progress. Third, meteor observers have, for many years, suspected the existence of small clusters or “outbursts” of meteor activity not formally associated with a recognized shower. The reason for these pockets of activity range from statistical fluctuations in the sporadic meteor distribution to isolated remnants of old extinct meteor streams. This “clustering” effect is not yet well understood. 9. What is a meteor storm, and how often do they occur? In meteor science, the month of November is best known for the meteor storms which have occasionally given us one of the most spectacular displays the night sky has to offer. On a single night, Meteors sometimes fell so thick it would appear as though the entire sky was falling, or gave the appearance of rapid forward motion of the Earth through the stars. The great Leonid meteor storm of 1833 did more to spawn the study of meteors than any other single event, along with great excitement by the general public. Meteor storms are not limited to only November, and In a historical parallel, the famous Giacobinid or October Draconid storm of 1946 also did much to spawn the study of meteors by radio methods. Meteor storms are generally caused by young meteor streams, in which the majority of the streams’ mass is still concentrated along that portion of the orbit occupied by the parent comet. Meteor storms occur when the Earth crosses the orbit of the meteor stream, at the same time that the main mass of the young meteor stream is crossing the orbit of the Earth. For streams with a low potential for orbital perturbation, this event may occur on a periodic basis, generally at around the same time that the parent comet becomes visible in the inner solar system. Streams which tend to undergo frequent orbital perturbations may only cause infrequent and rare storms, some never occurring again. To make the possibility even more remote, these streams also tend to be very narrow, with the Earth taking only a few hours to cross the concentrated portion of the streams’ path. Being on the right side of the globe, under good weather, on the right night is very important toward seeing these events. Two meteor streams are associated with the November storms, the Andromedid (or Bielid) stream, and the Leonid stream. The Andromedid stream is one that is subject to frequent orbital perturbations, and as such, only rarely crosses the Earth’s’ orbit in a manner favorable for producing a meteor storm. The last storm produced from this stream was on November 27, 1885; with 13,000 meteors per hour visible at the peak. By contrast, the last appearance of a shower from this stream was in 1940, with only 30 meteors per hour at the peak. The Leonid stream is much more favorable for producing storms, and generally tends to produce one every 33 years or so, although it has sometimes been disappointing. After feeble displays in 1899 and 1933, The appearance on November 17, 1966, provided the highest known rate of any meteor stream ever recorded. An approximate rate of 40 meteors per second (144,000 m/hour), was seen for about 1 hour as viewed from the western portion of North America, and the Pacific. Unfortunately, the east coast and Midwest were enveloped in clouds that night, disappointing a lot of amateurs and professionals alike. These extremely strong rates were not seen during the 1998-2002 Leonid storm period. Rather than one year with extremely strong rates, this period provided several displays that entertained observers world-wide. The Leonid meteors represent the fastest known shower meteors, barreling in at 72 km/sec. They are well known for their bright magnitudes, and their ability to produce extremely long duration trains, some lasting up to several minutes. On the other end of the spectrum, the Giacobinids, which last produced a brief outburst in 1998, has extremely slow meteors at less than 11 km/sec. 10. Where can I get more information about the Leonid storms? Wikiepedia’s Leonid page provides a good overview of recent activity. 11. Is there a chance of a meteor from a meteor shower or storm reaching the ground as a meteorite, and is it dangerous to observe meteor storms? The meteoroids which make up a meteor shower or storm are very fragile in nature, and are composed of a somewhat “fluffy” composite of material from which all volatile material has escaped, due to many trips near the sun. This material readily vaporizes in the upper atmosphere, and is given the descriptive name of “friable” material. While quite spectacular to watch, a meteor storm presents no real danger to the viewer, who is protected by miles of atmosphere. 12. Where can I find information on historical meteor observations? Olivier, C. P., (1925). Meteors. Baltimore: The Williams & Wilkins Company, (276 pp). Porter, J. G., (1952). Comets and Meteor Streams. London: Chapman & Hall, Ltd., (123 pp). Lovell, A. C. B., (1954). Meteor Astronomy. Oxford, New York: University Press, (463 pp). McKinley, D. W. R., (1961). Meteor Science and Engineering. New York: McGraw-Hill Book Co., (309 pp). The SAO/NASA Astrophysics Data System also has a wealth of information on historical meteor observations. Adams, M. T., (1980). “Observing Falling Stars,” Mercury (March-April, 1980). Cook, A. F., (1973). “A Working List of Meteor Streams,” Evolution and Physical Properties of Meteoroids. NASA , United States Gov. Publication. Hey, M. H., & Rea, D. G., (1986), “Solar System/ Meteors,” Encyclopedia Britannica (Vol 27, pg. 587). Jenniskens, P., (1994). “Meteor Stream Activity I: The annual streams,” Astronomy and Astrophysics, (1994: 990-1013). Jenniskens, P., (1994). “Meteor Stream Activity II: Meteor Outbursts,” Astronomy and Astrophysics, (1994). McKinley, D. W. R., (1961). Meteor Science and Engineering. New York: McGraw-Hill Book Co.
McLeod, N. (1997), AMS staff correspondence. Meisel, D. D., (1990). 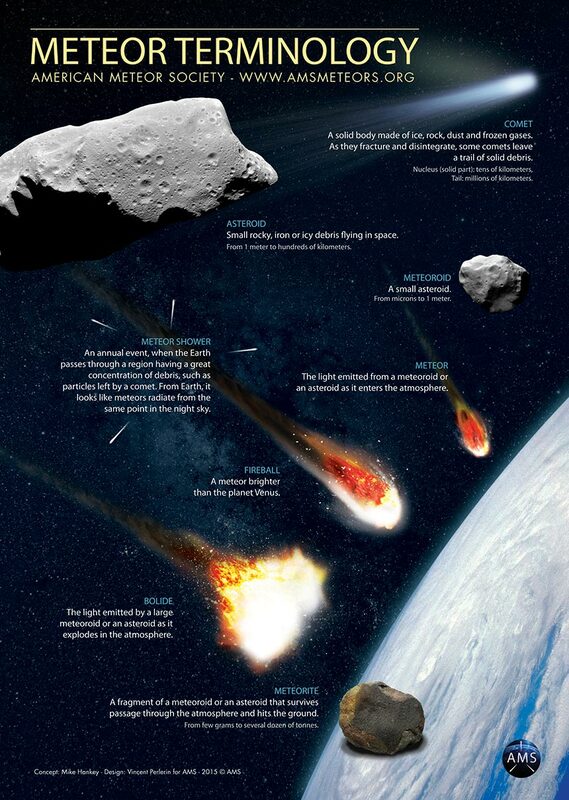 “Meteor,” McGraw-Hill Encyclopedia / EST 7th Ed. Olivier, C. P., (1965). “Catalogue of Hourly Meteor Rates,” Smithsonian Contributions to Astrophysics Vol. 8 Number 6,1965.